Watching Chicago Blackhawks games live at the United Center in Chicago is always the cherished desire of many hockey fans from Chicago, Illinois. As one of the most successful members of the Central Division of the National Hockey League’s (NHL) Western Conference, the Chicago Blackhawks has won a place in the hearts of many and usually attracts crowds of fans each time it plays. Since its founding in 1926, the team has not disappointed fans. It has five Stanley Cup Championships to its name and is the current Stanley Cup champion. So there is every reason for the team’s fan to ecstatic about an upcoming game, to buy a ticket in time, and to arrive in time at the club’s United Center arena for a live game. When Chicago Blackhawks holds a game, many fans travel to the United Center in Chicago. This means that there is always a likelihood that public transportation has way too many passengers to transport. The bus stops are usually packed with eager fans jostling for spaces in the buses. Besides, there is always the possibility of a fan failing to board early enough and to miss the start of the game. Arriving at the United Center when the game has started is always a recipe for a terrible experience. For instance, one would get a seat far away from the center of action and will be struggling to catch clearer views of the dazzling moves, spectacular scores, and stunning saves in the course of the game. To avoid that bad experience, we suggest that Chicago Blackhawks fans opt for limo transportation to the game in United Center. Nowadays many fans of Chicago Blackhawks opt for limos to the United Center. In fact, limos have gained more preference to taxis. Why is the trend turning in favor of limo transportation to Blackhawks game events? Firstly, there are perfect limos for hockey games and many fans just opt to use what is more suitable and glamorous for expressing their esteem for Chicago Blackhawks. Just like nobody wants to use a simple cab for a wedding because it does not reflect the pomp and dignity of the occasion, many fans cherish and respect their hockey team. They use limos to make this statement. The immense range of limousine models, that we provide, allows different people with completely different tastes, preferences, hobbies, ranks, and economic classes to get transported at their desired levels of convenience, urgency, and price. 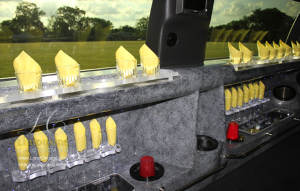 There are limos for corporate meetings, weddings, bachelor’s parties, and sports events. And there are suitable limos for all categories of Chicago Blackhawks fans. Secondly, limousines accord hockey lovers a stress-free journey to the United Center and a complete experience of the game. After booking a limo, the ride will begin exactly as planned and the Chicago Blackhawks fan will arrive in time, take a seat, make preliminary preparations, wait for the game, and watch all the events from a close distance. Limo service packages usually include music, TV systems, refreshing beverages, and luxurious seats. The traveling fan will simply need to sit back, relax, and enjoy the ride in great comfort. Moreover, limos to the United Center usually have keen chauffeurs to take care of the traffic and the luggage, relieving the traveling fan of any worries during the journey. With a limo, you reach the United Center when relaxed and mentally ready to watch the game. Those who used their own vehicles know that not only you have to drive to the game, your party is normally limited to those who fit into your car, you cannot enjoy yourselves on your way, have to worry about parking, not running over pedestrians and walk long ways to the stadium. When hiring our limo stretch or stretch SUV’s your party can start the moment you leave your home. Stocked bar available with many sporting packages allow you to enjoy comfort of a vehicle, refreshing and alcoholic beverages. You don’t have to worry about DUI or designated driver — just focus on the game and have fun! When you use limo transportation to Chicago Blackhawks game, many of your specific needs will be addressed by your chauffeur. Limo drivers are properly trained on customer care and you will get a remarkable cordial treatment throughout your journey. Moreover, our limo company vehicles are equipped with GPS navigation when taking fans to United Center for Chicago Blackhawks games. This means that your chauffeur will always find the destination, whether it is your hotel, cafe or your friend’s address you intend to visit when you travel to watch the games. What about the cost of using limo transportation to Chicago Blackhawks game? Our limousines are generally more affordable than taxi cab services because they use a predetermined flat rate. Therefore, a single payment will cater for the gadgets, chauffeur, drinks, gasoline, and all the other benefits you will receive. Using limos saves you from route planning and allows you to use the time on other things. During traffic jams, users of limos are never worried about the running meters because the payment is already settled. If the flat rate system is combined with special packages and discounts that are often given to repeat clients, the limos are affordable and superior.